Sam Marks presents… Christmas Gifts to dream of! I remember the Predator movie being sub-par, as well as Pierce’s last MI6 mission. This is not to mention Daniel Radcliffe’s first bout of wizardry from the acting school of Hogtwats in the Philosopher’s Stone. But the good news to the final installment of the Harry Potter franchise is the prospect of your very own invisibility cloak which made the antics of the thaumaturge trio possible! 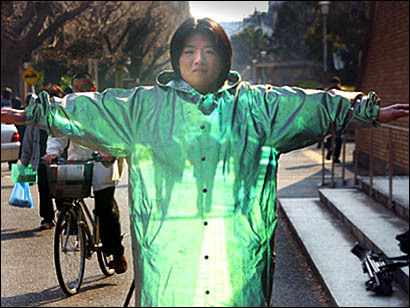 The concept is fairly simple, the metamaterial bends light around and object so it projects what is behind it. The problem is the making of a molecular structure that is substantially smaller than a wavelength of light, or that with a substantially high negative refractive index (never mind the physics). This little wonder may be hitting the stores as early as 2020 according to the physicists in Perdue University Canada. The metamaterial itself is already widely used in cameras but it still needs a little tweaking. Alas in this recession you would have to fork out a decent 6 billion bucks to get funding for it. Also, the main market of interest would be the army corps initially and they have the pockets deep enough to satify their agents. Bond, eat your heart out! I remember the more modern Star Wars franchise being a shameless black hole for fans spare change. But one can look forward to being able to talk to your long-distance friends and family in a 3D setting thanks to the work underway in Arizona. By simply using several cameras at different angles one can construct a 3D image. Then using lasers that interfere with eachother one can construct that image again in a 3D setting consisting of nothing but light. Another interesting point of information is the invention of the ‘hogel’ (the 3D version of the standard pixel). So far the refresh rates of such machines is 2 seconds making the video very slow. Much as we love Alexander Bell, this may replace the telephone sooner than we think. Move over Professor Xavier! Professor Moran Cerf, computational scientist at the Univesity of California, has constructed a database of hundreds of brain-scans correlating to participants looking at a range of images, including celery, strangely enough. A pattern is already brewing, and some preliminary mind-reading machines are apparently already used by Russia’s police force. Keeping our thoughts to ourselves might be a thing of the past and so any further advances are riddled with moral battlefields regarding the right to privacy. Natal studios had been working on as part of the Xbox Kinect franchise which can recognise movements from your feet to your face. It also has fabulous voice detection which can spot voice inflections of emotion. To debut the product back in 2009, Peter Molyneux and his team designed Milo, a 10 year old boy on a TV screen that could recognise facial expressions and voice inflections such as those of an upset or sarcastic individual. It even has a mind of its own, with the ability to ask how your day has been as well as the ability to not do his homework. Unfortunately Milo has been withdrawn as a project simply on account that it currently isn’t marketable as a video game. Some even say the project was faked. Again, philosophers out there might have a small problem with the project though. When does this become the God Dialemma where humans are capable of creating human consciousness?